Join Team OYOU by wearing our colors! Are you also interested in supporting the OYOU? Please consider making a donation at this link below! This is a premium high quality mid-profile unstructured ball cap! Get yours today! These shirts fit true to size! Available in Adult Small to Adult XXXL. Navy shirt with white OYOU logo. We also included a plain shirt so you could see the neckline. Support the OYOU by buying a t-shirt and wearing it out (literally)! 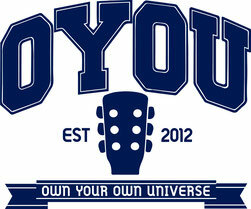 Snap a photo of you wearing your OYOU shirt and email it to us at ownyourownuniverse@gmail.com or post it on your Twitter or Facebook page and let us know on our pages so we can share it with fans of the OYOU! We wanna see you "Own it!" Navy shirt with white OYOU logo. We also included a plain shirt so you could see the neckline (Large is light blue). OYOU T-shirt for the little ones! Available in Kid's Extra-Small to Kid's Medium. Light blue shirt with black OYOU logo.